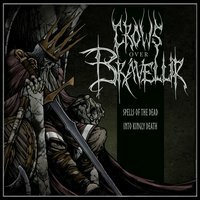 CROWS OVER BRAVELLIR is Black/Death Doom Metal band from Sweden. “Spells of the Dead/Into Kingly Death,” is a single/EP that contains two tracks with a run time just under 19:45. Apparently that is long enough because with just these two tracks, I wish this album was a full length with double the run time. Both tracks are downright impressive—they just scream, “Take my money now!” Having formed a few years ago in 2016, they are obviously new to the scene but goddamn they definitely have what it takes to last. The first song, “Spells of Death,” has opening moments that are filled with bass so thick with fuzz I could almost feel it coming out my ears. Rikard lays down some fat, hammering bass riffs and does so with utmost conviction. Likewise vocalist and guitarist Martin clearly knows what it takes to make meaty Doom riffs. However, in a very nice twist, a lot of his riffs also have a Black Metal sound to them. His vocals are a cross between rough cleans and Death Metal and it works so well for their sound. “Spells of the Dead,” is highlighted by many elements, not the least of which is the guitar solo which stands out among the band’s more extreme elements as being more on the traditional side of Doom—Martin plays a lot of different styles and it always comes out sounding like it really belongs. “Into Kingly Death,” is an early contender for Doom Metal song of the year. The melodic bass and clean guitars, mixed with some acoustic, add in Folk elements. As the song progresses, Tomas' drums pick up, complimenting the song the entire way. The guitar solo around the two minute mark is birthed from the previous notes masterfully—it sounds so natural instead of a purposeful bridge to the rest of the song. Halfway thru the song, the band switches to Black Metal, the drums picking up speed with the double bass, in perfect harmony with the riffs. This part segues into an almost psychedelic moment which in turn transforms into a rumbling chaos. The band features members of other bands, such as GRAVE; hopefully this ends up being more than a side project or at least a project that will put out some more material. It only has two tracks but I’m going to give it a strong rating because, well, they are great and represent the best elements of this style. The Doom genre needs more material from CROWS OVER BRAVELLIR.